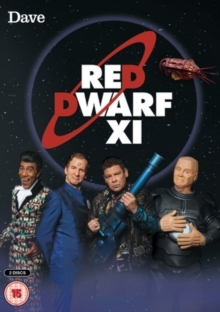 All six episodes from the eleventh series of the sci-fi comedy following Lister (Craig Charles), the last human in the universe, his hologram colleague Rimmer (Chris Barrie), android Kryten (Robert Llewellyn) and Cat (Danny John-Jules) as they float through space on the mining ship Red Dwarf. In this series, Cat falls in love with a female Cat, Kryten has a midlife crisis, Rimmer saves the life of a bio-printed Captain and Lister has his kidneys stolen by a droid. The episodes are: 'Twentica', 'Samsara', 'Give and Take', 'Officer Rimmer', 'Krysis' and 'Can of Worms'.